Ever wondered how users interact with your long articles or lengthy landing pages? Wouldn’t it be great if you knew how much users scroll when viewing a page on your website? If you are already using Google Analytics, then you can easily track user scroll depth activity. In this article, we will show you how to track user scrolling in WordPress with WP Scroll Depth. 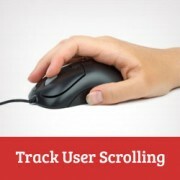 Learning how much users scroll will help you understand how well your articles are doing, and how you can improve your website. Note: Before you begin you will need to install Google Analytics on your WordPress site. First thing you need to do is install and activate the WP Scroll Depth plugin. Upon activation, you need to go to Settings » Scroll Depth to configure the plugin. The default options will track scroll depth for all pages on your WordPress site. All you need to do is click on the Save Changes button to store plugin settings. 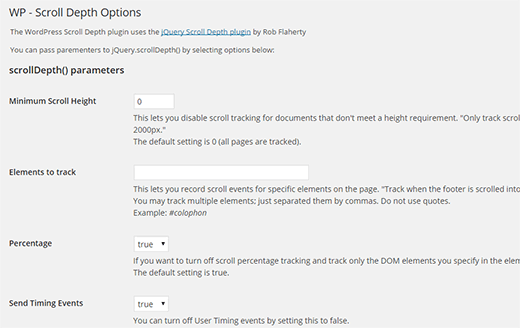 WP Scroll Depth plugin uses jQuery to track scrolling on your WordPress site. It monitors four scroll points 25%, 50%, 75%, and 100% of the page height. When a user reaches a scroll point, the plugin sends an event to Google Analytics using jQuery. If you are new to Google Analytics, then take a look at our beginner’s guide on how to use Google Analytics for your WordPress site. You can view Scroll Depth event data under Real-Time » Events on your Google Analytics dashboard. For more detailed scroll depth data, you need to click on Behavior » Events » Overview under your Google Analytics dashboard. We hope this article helped you track scroll depth on your WordPress site using WP Scroll Depth and Google Analytics. With this plugin, can you see desagreggated data in Google Analytics? I’d like to see the scroll results per article.